A political club that organizes and leads the Filipino American electorate in New York City and New York State. WOODSIDE, QUEENS — Tenants, homeowners, and small businesses in Woodside joined with community leaders and organizations to overwhelmingly oppose a community-killing, three year, five story megachurch construction project at a Queens Community Board 2 hearing in Woodside this evening, Tuesday, September 27. The community argued that the megachurch threatens to inflict further out-of-context development at the corner of 69th Street and Woodside in what is already a chokepoint and a crossroads connecting the Brooklyn-Queens Expressway to Roosevelt Avenue and the communities of Sunnyside, Woodside, Jackson Heights, and Elmhurst. While previous occupants of the church space have elected to expand in other industrial areas, the current owners of the facility intend to make Little Manila the American headquarters of their Brazilian Pentecostal Church. They are requesting special permission from the City to waive the rules so that the church is able to build an additional three stories higher in order to house a recording studio, private apartments for church leaders, and a spa. Community leaders, organizations, and many long-time residents at the hearing fervently voiced serious concerns and outright opposition to the proposal. The projected three-year construction, in addition to being out of context and 30 feet taller than surrounding buildings, threatens to generate short-term and long-term disruptions. These are three years of revenue disruption that many small businesses would not survive intact. If completed, the Woodside community would then have to deal with massive pressures on street parking as a result of the inadequate number of spaces promised by the development (only 150), as well as an 11-foot wall that will surround the development, shutting off the megachurch complex from the street and creating a “dead zone” that will be devoid of retail or street life especially late at night. Many groups urged the developers to sit down with the Community Board and local representatives from the immediate and surrounding community to negotiate an amicable solution and plan that works for everyone. A growing list of organizations opposed to the development include Filipino American Democratic Club of New York, Anakbayan New York, Queens Anti-Gentrification Project (QAGP), National Federation of Filipino American Associations (NaFFAA) – New York, Unipro – Pilipino American Unity for Progress, Inc., NYC Asian-American Democratic Club, BAYAN USA, Philippine Forum, The Filipino School of New York & New Jersey, and NY Committee for Human Rights in the Philippines (NYCHRP). 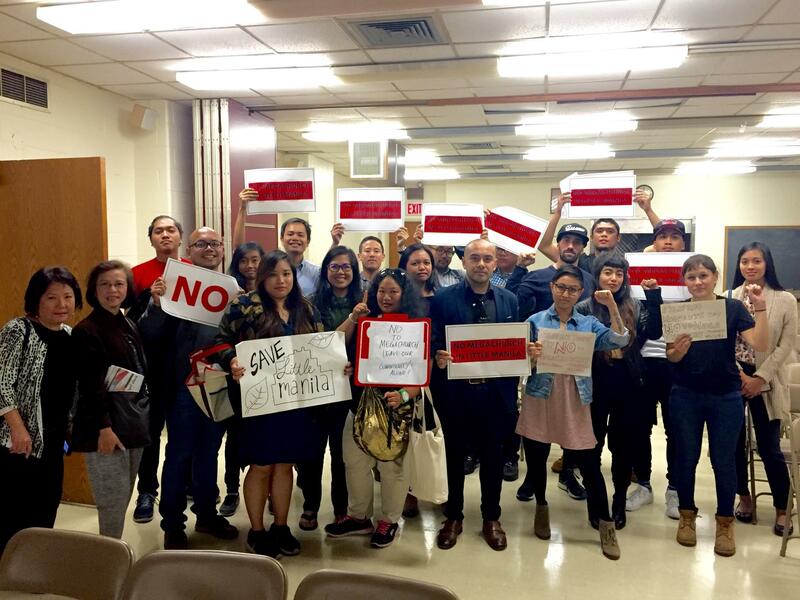 These groups will mobilize the Woodside and Filipino American community to respond again to another hearing scheduled for November 3rd in front of the full Community Board. Labor-donated by the Filipino American Democratic Club of NY and not authorized by any candidate or candidate's committee.